Hitchin railway station in 2014. First Capital Connect class 365508 platform 2 and 365522 in platform 1 at Hitchin on Friday the 1st of August 2014. 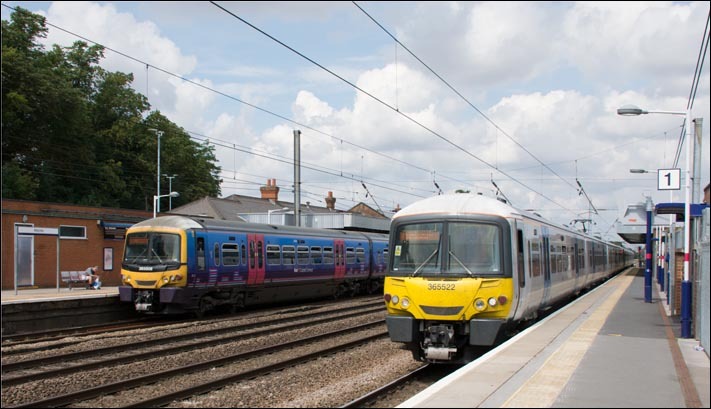 Apart of a coat of paint todays Class 91s and 3655s and 317s are still the main trains in 2014. Hitchin station has not changed that much in the last few years apart from the flyover for the Cambridge line trains at the North of the station. 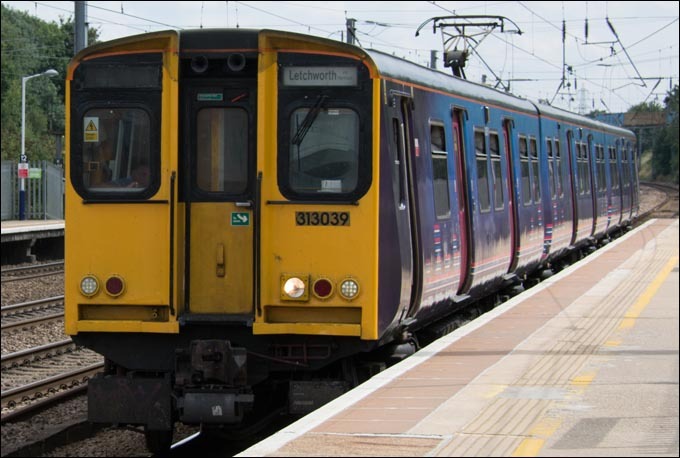 The local Great Northern EMUs of Class 365 or 317 or 321 stop at all stations with the local of peck trains between Peterborough and Hitchin. Then these trains will stop at just some of the stations south of Hitchin to Kings Cross. The local FCC Kings Lynn and Cambridge trains also stop here. Some of the First Capital Connect trains speed though on the fast lines. Virgin East Coast now run the main line trains on the East Coast in 2016. 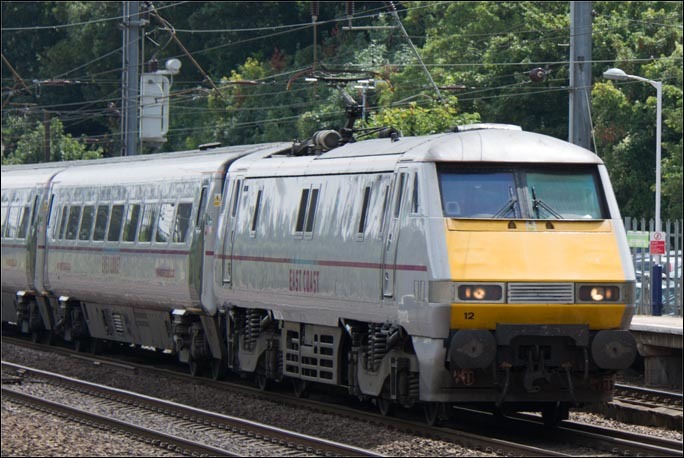 In 2009 it was National Express East Coast (NXEC) and be for that it was GNER. 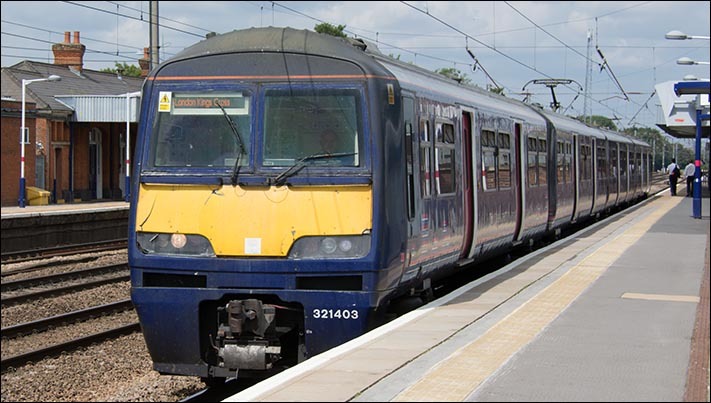 These trains with class 91s or HSTs use the fast lines though Hitchin station. A fly over for junction at the south of Hitichin station for the Cambridge line trains has now been built and is in use saving some of hold ups on the ECML. The First Capital Connect all stations trains between Peterborough and Hitchin to Kings Cross trains most of which use class 365s EMUs stop here. Also some of The First Capital Connect Kings Lynn and Cambridge line trains also stop here. Since 2014 'Great Northern' has now taken over these First Capital Connect services. Today Virgin East Coast, East Midland Trains and GBRf are just some of the names on the trains. The name on the train does not mean, thats whos train it is these days. These names keep changing, but that means I have to keep taking photos. I also take photos of preserved railways with steam diesel and electric trains.There is lots more to add and I keep taking More!